An Argyll charity is encouraging people to get creative with their breakfasts as part of a new awareness-raising drive. Mary’s Meals now gives more than 1.1 million children in 12 countries around the world a daily meal in their place of education. Its latest campaign to raise funds and awareness is encouraging people to make a smiley face with their porridge toppings before posting a picture on social media with the hashtag PorridgeSmiles. On Monday, Scottish oats company Stoats served up bowls of porridge to the 250 staff at People’s Postcode Lottery in Edinburgh to help launch the campaign. 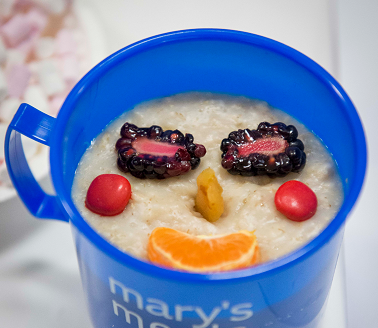 The firm is an official partner of World Porridge Day on October 10, which supports Mary’s Meals. Alan Brown, executive director at the charity, said it was great to see so many people getting behind World Porridge Day. “The daily mug of porridge Mary’s Meals provides to hungry children in school makes such a difference to their lives, allowing them to reach their full potential,” he said. Donations can be made by texting “OATS16 £2” to 70070 to provide a hungry child with meals in school for a month.